BRUSSELS, Sept 12, 2011 (AFP) - Debt-burdened Greece has pledged fresh action to trim its deficit as eurozone leaders geared up for crunch talks this week to save Athens from default and tame Europe's runaway debt crisis. As European powerhouse Germany warned of the possibility of a worst-case scenario "orderly default" for Greece, Greek Finance Minister Evangelos Venizelos announced plans Sunday to slice an extra two billion euros off the deficit. AFP - Greek Finance Minister Evangelos Venizelos arrives at a press conference on September 11, 2011 in Thessaloniki. 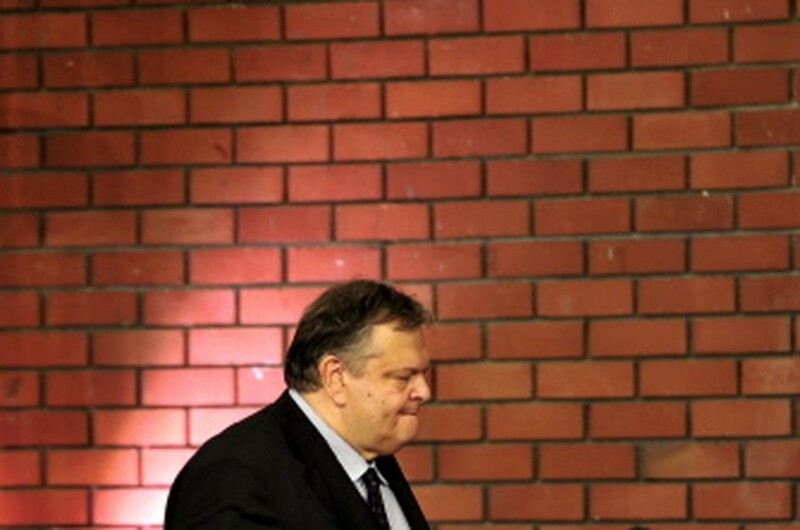 Venizelos announced new budget cuts, totalling around two billion euros. The pledge to raise fresh funds, through a real estate tax and a month-long salary cut for elected officials, follows growing concern Greece could fail to meet terms set under a 2010 international bailout by the International Monetary Fund and 17-nation eurozone. In Brussels, the move by Athens caused immediate relief after a summer of market havoc and a bleak week of pessimistic pronouncements evoking the implosion of the eurozone. EU economy commissioner Olli Rehn hailed the Greek decisions and said IMF, European Union and European Central Bank experts would head to Athens in the coming days to look at a new eight-billion-euro tranche of Greece's 2010 rescue package. "Once Greece meets the conditions, I expect the review by the troika could be concluded by the end of September," he said. The troika of lenders left Greece in displeasure earlier this month due to slippage on targets for debt and deficit reduction set under the 110-billion-euro rescue. Next Friday and Saturday will see the first post-summer talks, in Poland, of finance ministers from the increasingly divided nations sharing the euro. Split over how to address a crisis exacerbated by global economic gloom, the ministers are to discuss obstacles holding up a second 160-billion-euro ($220 billion) bailout for Greece, agreed in principle at a July 21 summit. But barely seven weeks on, pressure on the single currency has hit historic highs amid rising fears a divided Europe could fail to stem debt contagion. Top economists such as Nouriel Roubini and even Germany's former chancellor Gerhard Schroeder have warned only full "political union," something approaching a "United States of Europe", can keep the euro on its feet. And US Treasury Secretary Timothy Geithner said at a weekend meet of the G7 powers in Marseille that European states needed to do more to prove they had the political will to deal with the financial crises roiling the continent. But already, Finland wants cash collateral from Greece before lending any more money, and Slovakia -- which sat out the first bailout -- is threatening to delay ratification of the second rescue until year's end. Meanwhile, exasperation with debt and deficit-offender nations is growing in Germany, Finland and the Netherlands. Dutch Finance Minister Jan Kees de Jager last week raised the prospect of expelling offenders from the euro. "If you can't stick to rules, you have to leave the game," he said. This weekend, German Chancellor Angela Merkel called on her compatriots to be patient with Greece in its struggle to whittle down a 350-billion-euro debt mountain. "What hasn't been done in years cannot be done overnight," Merkel said, while reminding Prime Minister George Papandreou not to waver in his reform. "Greece knows that credit is only available if it meets its obligations," she said. But Germany's Economy Minister Philipp Roesler pointedly said in a column Monday that Europe could no longer rule out an "orderly default" for Greece. "To stabilise the euro, we must not take anything off the table in the short run," Roesler, who is also Germany's vice chancellor, wrote in the column for the conservative daily Die Welt. "That includes as a worst-case scenario an orderly default for Greece if the necessary instruments for it are available," he said. In another blow to the eurozone's struggle to speak with a single voice on the crisis, ECB chief economist Juergen Stark abruptly quit Friday, sending the euro and stocks tumbling. The hawkish board member was an outspoken critic of the bank's controversial buying of eurozone government bonds on secondary markets to prevent borrowing rates rising to prohibitive levels. The programme had been on hold until last month, when investors fled Italian and Spanish bonds, threatening to force a bailout of the eurozone's third- and fourth-largest economies. The ECB has since bought more than 50 billion euros in eurozone debt, leading to growing calls for governments to issue jointly backed 'eurobonds' in future -- a demand roundly rejected by the currency area's main paymaster, Germany.